Why can’t stick figures just get along? There are plenty of Flash games chronicling the seemingly endless cruelty that stick figures perpetrate upon each other. Stick Bang, a new game by FreeWorldGroup, illustrates this age-old conflict by putting you in a world where “Stick-Giants” wage endless battles for ultimate control of Stickland. The game takes stick-on-stick violence to a whole new level. Not only will you be fighting your own kind for battlefield supremacy, but you’ll be using other tiny stick-figures as your ammunition. There are no fewer than 14 different types of tiny stick-figures, and each type has a unique ability that will determine how best to use them in battle. These “ammo types” are for both offense and defense, ranging from the (indelicately named) “Suicide Bomber,” who explodes on contact, to the “Brella Smella,” who raises a protective umbrella for a short time. Between rounds, you’ll be able to spend money that you’ve earned in combat to purchase extra ammo. Most ammo-types can be upgraded as well, increasing their overall effectiveness. 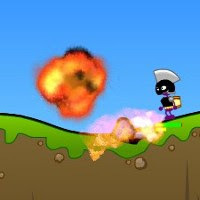 Stick Bang liberally borrows from the style and gameplayof the classic “Worms” games, except that the action takes place in real-time. You’ll move back and forth across a fully-destructible 2D map. With the mouse, you’ll select your “stick-ordinance,” aim (determining your shot’s angle and velocity), and fire at your enemy. A toolbar at the bottom of the screen will display all of the different “stick-ammo” types, which you can also select by clicking. Stick Bang is an amusing game that can be fairly challenging at times. It’s visually pleasing with a decent sense of humor. The only real down-sides are the lack of multiplayer (this kind of game begs for it), and the trial-and-error nature of figuring out effective uses for all of the ammo-types. All in all, it’s worth trying for yourself.